Is it fair chase? Is it too easy? Too hard? Unethical? We all have our opinions on how we want to hunt animals. What we think is or is not acceptable. I’ll be the first to admit it. I’ve fallen victim of thinking that my way of hunting (bowhunting and only bowhunting) is better or more challenging than others. That it makes me a more seasoned outdoorsman. 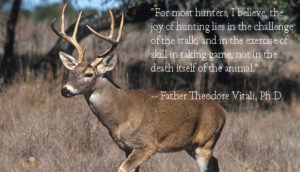 Or thinking others had it too easy with a rifle making their method of hunting not fair for the animal. Well that can’t be farther from the truth. Many arguments between hunters are that rifle hunting is too easy. Thoughts that a rifle hunter doesn’t have to get near as close as with a gun thus taking that animal easier. That shooting an animal from 300 yards doesn’t give them a fair chance. Well, then there are others that go to another level just using stick and string bow. They mak their own arrows along with sharpening broadheads on a rock. They can have the argument that even a compound bow and being able to reach from 60 yards just isn’t enough of a challenge. Honestly though does any of these methods make it an unethical harvest? NO. A lot of this I could chalk up to ego. This isn’t how we should be thinking. I was watching a hunting show the other day and a guy shot an elk from 500 yards out. I thought, “well that isn’t much of hunting, the animal wasn’t even close and has no chance of knowing the hunter is there, no chance of winding him”. Yet that gun went off and that bullet landed EXACTLY where it needed to be to safely and ethically harvest that animal. Right away it hit me. It’s not about what we think is easier or more of a challenge. It’s about doing it ethically. The hunter I watched on TV talked about all the practice he did at the range to ensure he could make those shots and that he has done from farther out. He practiced to make sure that the animal he was trying to harvest was going to be harvested ethically so it wouldn’t suffer from a long lasting injury. HUNTERS ARE ALL ON THE SAME TEAM. In fact, we have the same objective. We aren’t here to compete against each other. Sure there are a few bad eggs out there breaking laws and poaching but that’s like with everything else. We hunt to provide meat for our families or to feed ourselves the most healthy and organic meat we can get. If that is the main goal of what we do then why should it matter how one guy or the other does it as long as it is done within the law, is ethical, and sportsmanlike. In any case, no more stroking our egos on which method is THE GO TO METHOD. Let’s just hunt. I like it! Let’s all just be hunters! Return to the old days of just being happy and excited when your buddy takes a deer or any other game animal. It’s about the camaraderie of the hunt and spending time in the outdoors. Let’s not forget that!